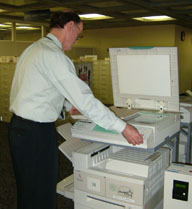 Photocopiers, book scanners, microfilm reader-printers, and microfiche reader-printers only provide black-and-white paper copies and black-and-white digital images. Receipts are only available for value placed on copy cards. Checks or credit cards are not accepted for copying performed by customers on site. Digital images of Library materials made using Library equipment must be saved to flash drives (aka USB drives, jump drives, or thumb drives). Customers may use their own flash drive, but the flash drive must be scanned by library staff for viruses before it's used on any Library equipment. Flash drives may also be purchased from the Library for $10. Most materials in New York State Library's collection are available for copying. 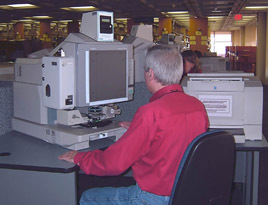 The State Library operates in full compliance with US copyright laws; copyrighted materials can be copied if they will be used solely for private study, scholarship or research in accordance with the copyright law (Title 17, US Code, particularly Chapter 1, Sections 107 and 108). Other restrictions are based on physical condition of the materials or legal restrictions imposed on particular collections.